This article really only applies if you are hosting the web server in your local office or place of business. If you are hosting your web server in a data center somewhere and you never see it, this article is probably not for you. 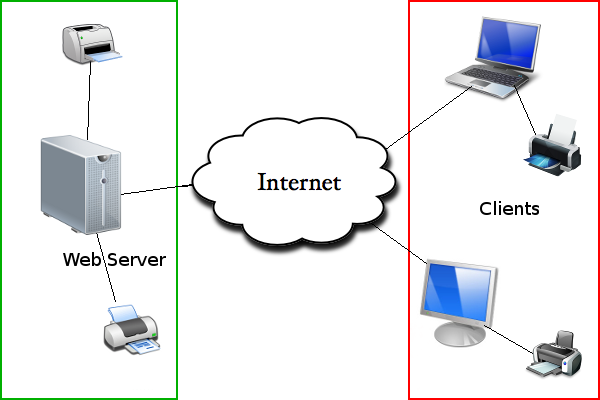 In the diagram below, pretend the server and attached printers are in your office building somewhere, and the computers in the red box are your clients out on the Internet somewhere. Note that the printers at the client side are not used in this application. Another possible setup would be if everything is on a private internal network, like the diagram below. In this case everything is in the green box because it is all on an internal network joined by a network switch. The two printers are in yellow boxes because they are only visible to the server if shared from those attached network computers, and the computers are turned on. So now that we have the big picture, there are a couple other things to note. The web server needs to be running Windows, not Linux. The PHP Printer functions are Windows only. 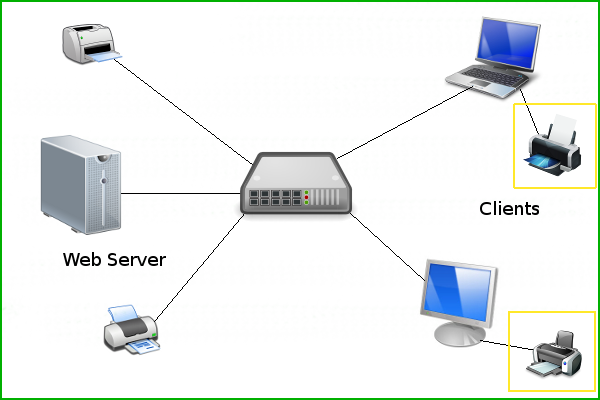 The printer(s) can be connected locally via USB/Parallel, over the network via IP JetDirect, or shared off of another server/computer. The printer in line 6 is in my windows printer list, and has to be matched exactly. That function can be called without a printer parameter, and PHP will use the default printer specified in php.ini or try to detect it based on how it is set in Windows. I wanted to do close to a full page of text, so I went to lipsum.com and generated some sample text and saved it to a text file. So here is the printed result, and the cool thing is that the text was almost exactly a full page. The not-so-cool thing was that it doesn’t do simple things like word wrap. Luckily, we can run the text through wordwrap() before sending it to the printer to easily fix that. For future examples, I will be using my PDFCreator printer so I don’t waste paper (or money) during testing, and I encourage you to do the same. If you want to print with a custom font, it is done using functions that are similar to the GD Library functions. You need to define the font, X/Y position, and other font weight properties. In this example, I’m going to use the freely available barcode font to print a barcode on a piece of paper. In this example, I am also going to define the printer document and the individual page. The printer functions only support writing bitmaps (bmp), so you will have to convert the images to that format before using it in this application. The X,Y parameters in the printer_draw_bmp() function are in inches. Several shapes can be drawn as well. The example will show two horizontal & parallel lines of different length. Couple uses come to mind, and I’m sure there are others (post them if you have a good one!). Automatically print packing slips / invoices at a shipping center as customers place orders. On an intranet website, have all the company printers configured at the server side so users can use the web application w/o worrying about setting up the printers at their workstation. For more information, check out PHP print functions. “But what about Linux servers!”, you say. Well, as previously stated, the PHP functions don’t support anything other than Windows, but there is an alternative. PHP4IT.com has an article titled Printing a form directly to a PCL printer (Linux) that should help you with manually building the Postscript file and writing it through to the printer. That should help get you started. I’m using Windows Server 2008, with php 5.3.8 and apache. Would be extremely grateful if you could point me in the right direction. Thanks! Thank you very much for this great learning, everything is working fine as per. I just to ask you one thing, when i am trying to use printer_list(PRINTER_ENUM_LOCAL | PRINTER_ENUM_SHARED) for detecting printers attached with my system, then it always give me an error apache error. can you please help me how to fix this problem. I set this up and everything installed. However, I don’t get any errors and nor do I get any output…no file. I added PDFCreator to my system too. Again no errors, but I can’t seem to find the PDF the should have been created. Any ideas?